This freestone military effigy in the north aisle of Hungerford church reclines on a low (modern) base. It is defaced and mutilated, and the lower legs and right arm are missing. The figure is crossed-legged, and the head rests on two cushions (the upper in a diagonal position). The right hand grasps the edge of the shield (an unusual gesture), and the long surcoat is worn open in the common v-fashion. This is the only surviving pre-Reformation effigy from the previous, Early English / Perpendicular church, which was demolished between 1814 and 1816 due to disrepair. The present church was designed by architect and builder John Pinch the elder, and completed in 1816. 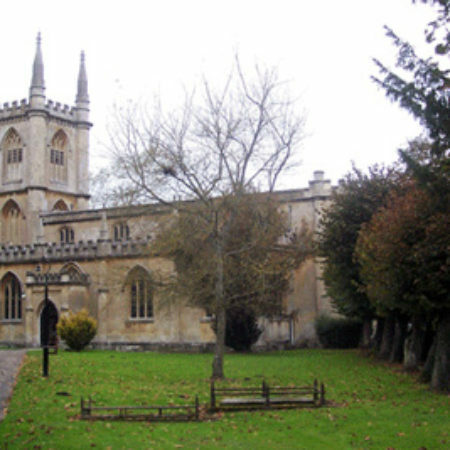 Pinch, who was active in Somerset and Wiltshire, also designed St Mary’s, Bathwick in Bath (1817-1820). 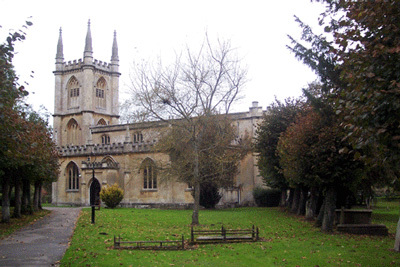 This explains why Hungerford church is built in the ‘Georgian Gothic’ style and constructed of Bath stone. The building material was transported up the adjoining and recently opened Kennet and Avon canal. There is some confusion as to the identity of the effigy as there are no accompanying heraldic devices, inscriptions or documentary evidence. The figure is currently labelled ‘Sir Robert de Hungerford (d. 1352)’, and there is a general consensus among antiquarians and modern-day historians alike that this is the remains of his tomb. Certainly, the Hungerford family were living in the town from the twelfth century, and Robert de Hungerford founded a chantry dedicated to the Holy Trinity in the south aisle of the church in 1325. He was born c. 1285, the eldest son of Walter de Hungerford and Maud Heytesbury. Robert was an important man, appointed bailiff for the Duchy of Lancaster in Berkshire and Wiltshire in 1313 and sitting for Wiltshire in parliament three years later. In 1322, Edward II made him keeper of the southern lands of the Earls of Lancaster and Hereford who had been executed for arranging the murder of the King’s favourite, Piers Gaveston. Sir Robert was later made a commissioner to inquire into the possessions of the Despensers after their attainder in 1328. Although Robert married twice he was the last of his line. However, the fact that the effigy has been dated to c.1300 (most recently by Mark Downing), strongly suggests that it is not the tomb of Robert de Hungerford. This mid-fourteenth century period of armour has been described as the age of superimposition, and the layers of garments/defences on the body from inside outwards comprised: shirt, aketon (gambeson), haubergeon, coat-of-plates, coat armour. Although the Hungerford figure is worn and the greater part of his limbs has been lost, it is clear that the figure wears the long surcoat of an earlier period and there is no evidence of plate defences, which were commonplace by the mid century. Possibly the effigy instead commemorates Robert’s father, Walter, who appears to have died after 1308. Robert may himself had another monument, only the inscription of which survives. It was not unusual for tombs to get muddled up during church rebuildings. Part of the reason for this case of mistaken identity is the existence of an incised indulgence slab, inviting viewers to pray for Robert de Hungerford in this life and the next. The slab is currently attached to the north wall of the north aisle (behind the effigy). Although it makes reference to Robert de Hungerford, there is no evidence to link it to the surviving effigy. Cross-legged effigies of men in armour like that at Hungerford have commonly, but wrongly, been thought to commemorate crusaders. Most such figures date from the period between the second half of the thirteenth and the mid-fourteenth century, but the participation in crusades by the English military classes was waning by this time. 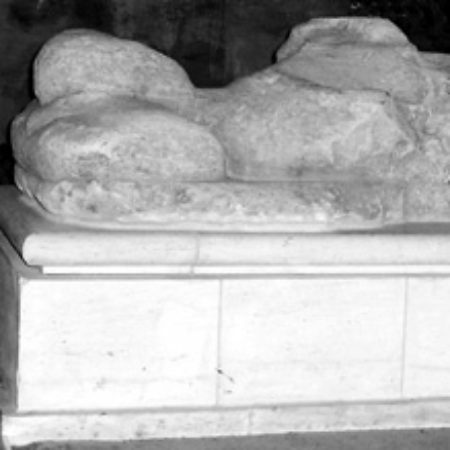 Many knights commemorated by cross-legged effigies have been shown to have no connection whatsoever with crusading; the same is likely to be true of the man commemorated at Hungerford, whoever he was. Downing, M., Military Effigies of England and Wales: Bedfordshire to Derbyshire, Vol. 1, Shrewsbury 2010. Money, W., An Historical Sketch of the Town of Hungerford in the County of Berkshire, Newbury 1894.